I'm curious about the price for this. It supports 1.6kg, toolless design and 32bit board. would cool if one of the handles had a pan/tilt controller. Nebula 4200 5-Axis stabilizer forthcoming, handling up to 1.6 kg, 32 bit board. This looks very interesting! To me; because of the 2 handle bars instead of 1, which the Nebula 4,000 has. Depending on the price range this could be a serious competitor with several bigger brands. Nebula4200 5-axis-stabilizer single/double exchange operation, quick and easy replacement of single 3-axis stabilizer or 5-axis stabilizer. 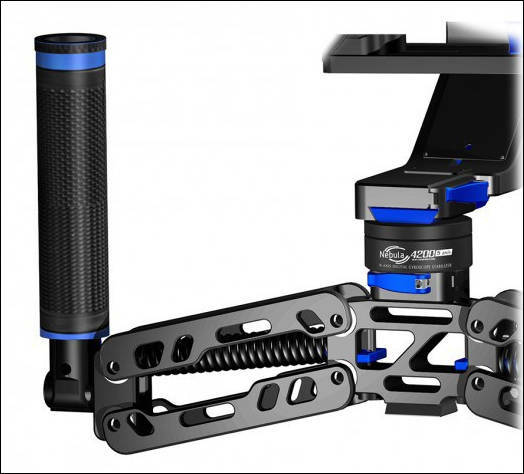 The nebula4200 5-axis gimbal include single handle and the nebula4200lite 3-axis stabilizer sold separately. Nebula 4200 has three versions. Nebula 4200 5-axis, Nebula 4200 Pro and Nebula 4200 Lite. Nebula4200 preorders begin in Sept. 28. Cool, do you have more details? Also, it seems like product naming will cause much confusion as it is different gimbals. Product details message will be gradually released, this is nebula4200 Multi-element configurations. Nebula4200 preorders begin in Sept. 28. and they will be shipped out after four weeks. After product released, we will sent according to the predetermined order. If they will be able to interchange the handles, that will great. For example, the 5 axis to the single hand top handle. Nebula4200 5-axis and Nebula4200pro full package contain a single handle. Nebula4200 5 axis stabilizer single/double exchange operation, quick and easy replacement of single 3-axis stabilizer or 5-axis stabilizer. The first test demo of Nebula4200 5-axis gimbal, the product is not the final version, just a test prototype. What happened to September 28th preorders? The 5-axis version is $999, the 3-axis double handle is $899 and the 3-axis Lite version is $799. The Nebula 4200 Gimbal features stabilization of five axes to control for the vertical, horizontal, pitch, yaw and roll axes while shooting. Offering single or double handle based operation, this gyroscope allows the user total control of their vision while ensuring the stability of the shot. While built to last , the handles are also easily repaired should they suffer any damage. What else makes the Nebula 4200 so remarkable? Aside from the 5 axes controls, the Nebula 4200 Gimbal contains a 32-bit board dual sensor controller. In addition to increased operation speeds and precision control, this new 32-bit board allows users to carry up to 1.6kg (3.5 lbs), permitting usage of a broad range of DSLRs and mirrorless cameras (e.g. Canon 5DSR/7D2/70D/100D/750D and more). Tool-less balance adjustment also permits the user full versatility of the gyroscopes control without the cumbersome equipment. 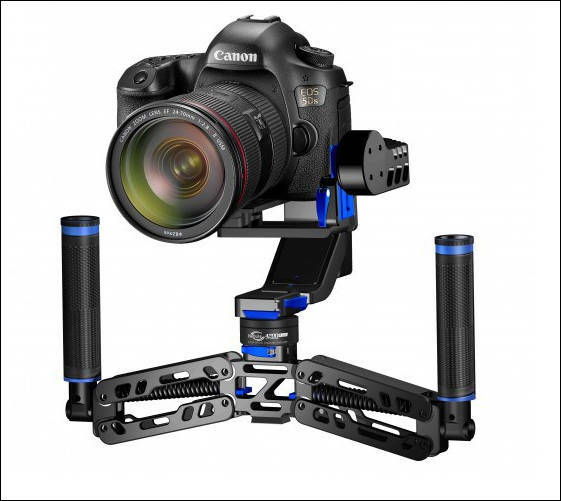 Equipped with Bluetooth wireless control for setup and manipulation, the Nebula 4200 Gimbal further eliminates any physical bumps during use. A wireless joystick can also be purchased as a compatible accessory. @Avril_Lovin, tell Nebula they need to put out a better useful demo video. @HillTop1,Test video will be sent gradually, the first tese demo video is Just to show the workings of the 5-axis. Please wait and look at our latest information. Reveal some latest production information of Nebula4200. Handle molds and joystick model, but the model shape is not a mass production version. Is there aa 3/8 thread somewhere on the 4200 that allows you to add a monitor? @spacewig There is a 1/4 thread and allow you to add a monitor.